I'd like to start a library of PPM inventions. Basically anything you have come up with that you'd like to contribute. Puzzles, machines, techniques, traps, hazzards, assembling multi-piece graphics, intro sequence anything! This will be a great way to improve all of our games and force some new innovations out in the process. Maybe you can think of a new, creative way to set up one of my systems, who knows! I will be posting submissions myself. It would be really nice if you could make a simple demonstartion of your submission and set it so it can be copied. I'll post a link as a demonstration. And please, if you look at someones designs, Thank them! NOTE: I think it should be acceptable if you post a simple link to a demonstration (if you have one). If it's made on the PPM please keep it to 1 level but please don't post a full game or a big flash link to your demonstration, I don't want this considered game sharing. Make your submission title stand out so it's easy to see as your going down the thread! How to make your characters shoot both ways. This is just my take and method on how to make a character shoot both ways when you turn from left to right. I've had trouble in the past doing this and have since figure it out. Hope this helps someone. 2. Make another object that will be used for your projectile. DO NOT TURN IT YET, LEAVE IT IN ITS ORIGINAL POSITION. 5. Add your characters movements. 8. NOW turn your projectile in the direction you want it to shoot. Awesome! Thanks for your submission! You should post one of your insane puzzles sometime lol. If you are ready, click "Apply" to confirm it. Now to make the most important part, you must drag THREE Widgets to the enemie to fulfill his work. First is the Spawner: The best way to avoid the collision beetween an another enemie is to change the Spawn interval's time (10 second is great for example), and change the Spawned lifespan's time (10 second is acceptable here too.) NOTE: NEVER make the Spawned interval's time lower than the other one. Then the collision may came up. Also, there is a way to make it without the Spawner, but I think if you understand this, you won't have problems with it! I hope this helped! Click Here if you want to see this invention in a game! I would like to show off the use of draggers,selectors and adders to create a sandbox game.First of all you will want to choose the blocks that will be used in your sandbox game.I usually give certain certain properties such as bomb blocks explode and glass blocks smash but that is entirely up to you.Once you have chosen the blocks you will want to add selectors,draggers and adders to them.Set the added life span to infinity so that your blocks do not disappear. Then test your game and press on any block to use them then drag them around and press space to build what you please. So, to start with the teleporters, you must take one of them, and turn off all of his collision layers. That teleporter is going to be an obscure teleporter to hide the secret player behind it. The next teleporter isn't so difficult too, you must turn on one collision layer. (I recommend the first one) It wasn't so difficult yet, was it? Got it? Well, then let's do something more complicated: The next player should be locked from the moving. THIS IS VERY IMPORTANT! If you won't lock the second player, it's going to move always while the real Player is moving too! 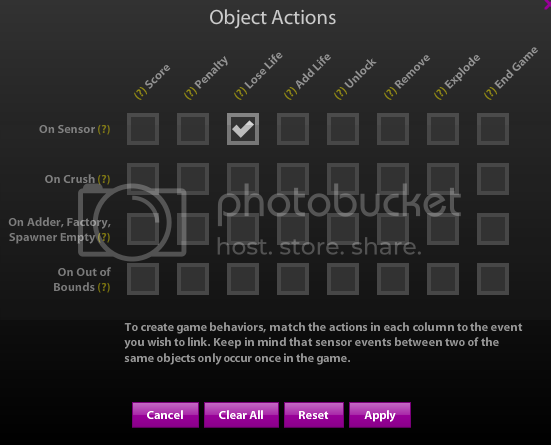 If you are done with it, turn on all of the sensor layers as the first player, and make it to unlock on SENSOR at the object action table. Next step, is to make this player (again: THIS player) to spawn at least one another player. If you don't understand, let me explain: Remember, this player has locked and made to unlock that. If you won't put a spawner on the player, then it won't "teleport"; in this case: won't duplicate. Anyway, the spawned player's numbers depend on how many duplicated player you want to. If I were you, I would make it to only one, because it's a bit strange when only one player goes in the teleporter, and two or more comes out! If you are done with it, try it and it will work! I hope it helped, and I didn't formulate it wrong. Remember: Ask anything! This one is the easiest invention in this thread I bet. Well, you only need four circles, two one is bigger, and two is for the real rolling eyes. Put the smaller ones in the bigger ones, but connect them with their edges. I mean, the big and the small one should connect on the edges. Look at the picture, if you don't understand. 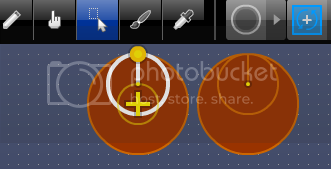 Lock the two bigger ones, and make them untouchable (remove all sensor layers). If you are done with is, choose the rotating physical motion form for the two smaller ones, and try to place their midpoints at the big circle's midpoints. The last thing to do, just put the Aimers to the SMALL circles, which will allow you to follow the mouse while you're playing the game. Not so hard, is it? This place is for the next invention. When creating enemies in certain games you can make a simple form of A.I. Place a Mover or a Slider on your enemy, then grab it and rotate it in the opposite direction. When you walk foward the enemy will walk towards you. Adding a jumper too can make some tough baddies because they mirror your movements. This little tip can be used in numerous way, just use your imagination. Make a block any shape and size you want. Then put a spawner and adder on it. Then give it a censor layer. Then make it so it will explode on censor. Cool! Could you make a little demo? I get what your saying but it would really help everyone out! And make the title a little more noticable so everyone will see you idea. Thanks for the submit man! This should be fused, but the only problem is that you put this in the wrong board, or is this a good one? I'll ask Tbremise and may he will fuse this. I know it should have gone in the other board probably but that's like the broom closet lol, and this one still falls under personal exhibition enough where it should be ok. But If Tbrem will fuse it that would be great, even if it was to the other board. I'll get working on something soon. First make a thin, invisible object. Like a clear pannel. Now set the sensor layer that you want for it. Now make your enemy graphic and turn off all sensor layers. Set your enemy to be removed on sensor. Make sure you've set your pannels to be removed on sensor as well!!! Now drop you enemy on top of your "Damage Cube" and your ready. This is only a one sided damage model. You could also take your last sensor and put a "cap" on it to protect it or you could place it in the middle of the "Damage Cube" and make it a two sided design. *A Life Bar can be intergrated into this as well by connecting each section to a damage pannel, maybe I'll post that later, that takes a LOT of work. Now I don't take credit for this invention. I saw it and figured it out on my own and I wanted to share with everyone. I'm posting a simplified version of the instructions because there is SO many thing you can do/add to this it's really up to you. You can get wild with the shapes but lets do a simple human for starters. 5. Add a pin joint to the Bottom Leg and set the "Green Hand" to the very edge of the Top Leg. 6. Now move the "White Dot" end of the pin joint to the very edge of the Bottom Leg. 7. Now grab the Bottom Leg and drag it up to merge with the Top Leg. The pin joint should just be a white dot or an X in a green circle. this means its "Pinned" together. 9. Now the Arms. Connect them using the same method, starting with the "Forearm"
11. The head is simple, just add a pin joint to it the same way and pin it to the body. Note-Now that you have the method for attaching limbs you can add weapons,hands, feet, wings, whatever! You probably want to add some kind of movement to your doll as well. Now it's time to get creative. How do you want your doll to move? there are tons of ways you can alter the dolls mechanics. I'll just list a few. Set all the body part properties to cloud and add draggers, movers and sliders. You can alter the sensor layers as well if you don't want certain parts passing thru each other. set the head properties for Balloon to keep it from swiveling around so much, it will tend to stay "heads up". For the ninja in my demo I added a Pointer to his sword. Now take this and make your own versions and post it if you come up with something good! Thanks can you do a video? Welcome to a guide to make your games 3d. Most of you know this already, but to the people who don't. Step 1: you need to draw a rectangle with the drawing tool from were you want to start. Step 2: go to the drawing tool that is at the bottom and draw another rectangle. Then put it above the recatangle. Step 3: Use the corners to make it a parallelogram. Step 4: If you are doing another one next to it. Click on one part then hold shift and press on the other. Take your fingers away from it a sec then hold shift and click on 1, then move it across and it will be another one. 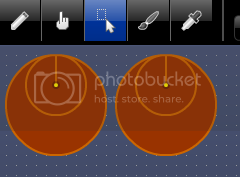 Step 5: When you finished going across use the drawing tool. Make sure it is the bottom one then draw another one then but to the right of it and finish of the 3d affect. I have, but I don't have time to do that. Draw a rectangle and get a graphic of a car and then put And place a mover and a rotator on it and then your car should drive.Make them smaller or bigger to give it the right drift.Make sure it is on motion resistance. Go into to detail using rectangles. I would add a goal.